Dr. Gray was born to be a chiropractor. Her father is a chiropractor and she was lucky enough to grow up getting adjusted. As the daughter of a chiropractor and working in her father’s practice in Wilson, Dr. Gray got to see first hand the difference that chiropractic care can make in a person’s life. This inspired her to become a chiropractor! Dr. Gray understands the importance of chiropractic care for a rapidly developing spine. Waiting for symptoms won’t necessarily reveal if you have a problem. It is so important to get checked for subluxations early on. In fact the younger the better! 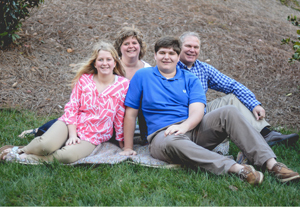 Dr. Gray’s mission is to educate other families about how important it is to get adjusted. Your QUALITY of Life depends on it!!! Dr. Gray has 20 years experience in private practice of family care with a special emphasis in chiropractic pediatrics, pregnancy. She started up the family practice, Gray Family Chiropractic, in 1996 because she knew that chiropractic can make a huge difference in the lives of ALL people young or old. She received the prestigious board certification in pregnancy and pediatrics through the Academy of Chiropractic Family Practice and became certified in the Webster Technique in July of 2008. Chiropractic is different because it awakens your own natural healing ability by correcting subluxations or spinal nerve stress. Dr. Gray knows that families want safe and natural solutions to many of today’s health problems. Every person has the inborn potential to be truly healthy. Children deserve the best chance to express their health and peak potential. Dr. Gray believes that the best hope for a developing nervous system is to be free of subluxations! Dr. Gray met her college sweetheart, Michael Gray, while studying at the University of North Carolina at Wilmington in 1989. They have been happily married for over 22 years. They have two children Jacob (17), and Haley (14) who attend Trinity Academy of Raleigh, a Christian school here in Raleigh and both have a passion for playing basketball. On the weekends, you will find the Gray’s at Jacob’s basketball games or Haley’s basketball AAU team, Triangle Flight tournaments and games. Dr. Gray has made it her life’s mission caring for young athletes, children, teenagers, infants, adults and even seniors. Give our office a call and come meet our fantastic caring team. We will help you take your first step towards better health. Webster Technique through the International Chiropractic Pediatric Assoc.